Located on the corner of Savannah and South Second Street at Expressway 83 DoubleTree Suites by Hilton Hotel McAllen is less than one mile from McAllen Miller International Airport. Take advantage of our complimentary shuttle service to and from the airport La Plaza Mall and Las Tiendas Shopping Center. The hotel is within walking distance of McAllen*s medical area and is only minutes from the new McAllen Convention Center the McAllen Free Trade Zone the McAllen Economic Development Center and the International Bridge to Reynosa Mexico. Our friendly staff looks forward to welcoming you at check-in with a signature warm chocolate chip cookie. McAllen Texas is part of the dynamic rapidly expanding area known as the Rio Grande Valley. Points of interest near our all-suite hotel in McAllen TX include the historic Quinta Mazatlan Dodge Event Center the International Museum of Art - Science and the South Texas Museum of History. 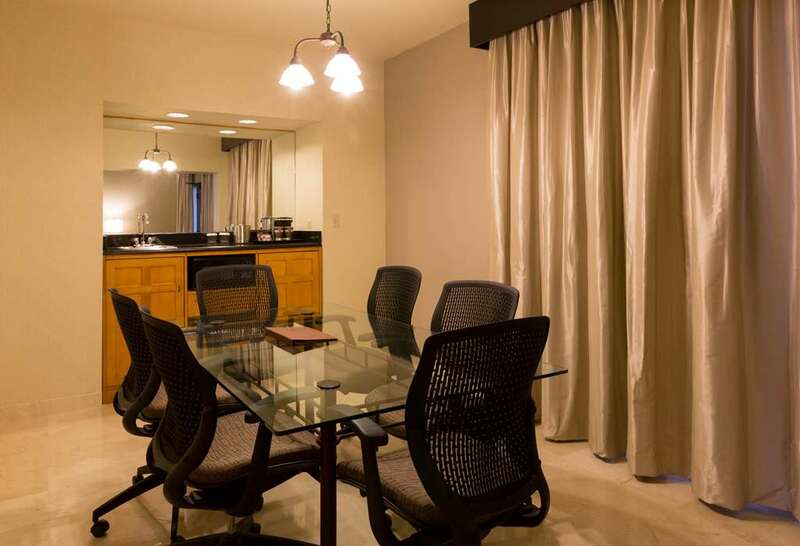 Feel at home in a spacious two-room suite equipped with a microwave refrigerator and complimentary WiFi. Choose our beautiful Presidential Suite for the ultimate stay. Ideal for events for up to 400 people the hotel offers six meeting rooms a boardroom and contemporary A/V technology. Update your presentation in the complimentary 24-hour business center. Recharge with a grab-and-go Starbucks coffee unwind with a drink in the comfortable lounge and savor American classics in the restaurant. Plunge into the sparkling indoor swimming pool energize in the fitness room or make the most of access to a large Fitness Center nearby. In Suite Dining: Enjoy in suite dining in the comfort of your hotel room. Simply select from a variety of dining options listed in your guest directory. Starbucks: The Starbucks conveniently located right in our lobby offers the Starbuck drink menu plus DoubleTree croissants muffins Danishes and whole fruit.